Find a chair and and get started on that giant inflatable duck (seemed like a good idea when you were packing). This resort is smaller in scale and tucked into a quiet residential area. Enough room to keep nappers, gamers and dinner-preparers happy. Hit the gym for a few sets, or head out to the tennis courts for a fierce game of doubles. 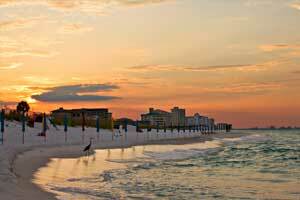 The beach is huge, with wispy dunes that overlook Destin Harbour. Magnolia House by Wyndham Vacation Rentals is one of a few smaller resorts nestled in a residential neighborhood, right next to the dunes overlooking Destin harbor. The resort is located within the prestigious Destin Pointe gated community on Holiday Isle, providing you peace of mind for a safe and fun family vacation. Relax by the beachfront seasonally heated pool, which is surrounded by an expansive lawn with a shuffleboard court. When it’s time for lunch, fire up the resort’s bbq grills for a family cookout. There are two lighted tennis courts and a fitness center, should motivation strike. You have an almost private beach in front of you that is just waiting to be enjoyed. Have the kids grab their buckets and shovels while you pack the beach bag with snacks, sunblock, and your latest beach read. Work on your sun-kissed look in a lounge chair while the little ones build a sandcastle. Air-conditioned one- to two-bedroom condos sleep four to six guests and offer all of the comforts of home. Full kitchens give you the freedom to enjoy easy meals in your condo. Take a family field trip to the nearby Publix for groceries. Back at the resort, bake up a batch of cupcakes and let the little ones assist with the mixing. While the cupcakes are in the oven, watch a sitcom rerun or a movie on the cable TV with DVD player. Once the cupcakes have cooled, let the kids help with the frosting and sprinkles. Don’t worry if the kids end up covered in frosting; you’ll have an in-suite washer/dryer. Private balconies are perfect for maximizing your time in the ocean air. Big Kahuna’s Water and Adventure Park offers over forty attractions including pools, slides, and water play areas for the kids. The Track is a family recreation center that offers go-karts, kiddie rides, mini golf and an arcade. Go-karts include the wild woody, family track, and rookie karts. The carousel, Ferris wheel, jungle jumper and red baron planes are some of the kiddie rides. Get ready to shop ’til you drop at Destin Commons. First stop: Starbucks for a latte or Double Shot. Surprise the kids with coffee-free frappuccinos. Check out the selection of jewelry at Pandora or cosmetics at Sephora. Get a new pair of jeans from Lucky or American Eagle. Little ones will love Build a Bear while your tweens won’t be able to get enough of Justice, Icing, and Claire’s. Pick up your next beach read at Books a Million. Hungry? Dine at Redbrick Pizza, Panera Bread, or Johnny Rockets. Gulfarium Marine Adventure Park is one of the world’s oldest marine animal parks and offers animal encounters and experiences including dolphins, alligators, penguins, seals, and stingrays. - The check-in location differs from the property location. To check in, go to 480 Gulf Shore Drive at Destin Pointe Magnolia House. Front desk is open 9:00 AM-5:00 PM daily.